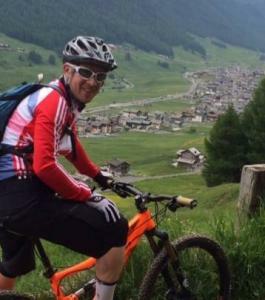 High Peak-based Simon Watts was part of British Cycling's mountain bike coaching team at the Rio Olympics. He explains how, with dedication and hard work, his passion for sport has seem him develop into a respected elite coach. "I'm proudly from Whaley Bridge in the High Peak. Until recently, when people asked me where I'm from, I would say "I'm a bit of a mongrel really", having lived in a number of places and with family all over the place. "It may be because me and my wife have had kids there, or maybe because at 38, I'm getting older and balder, but for the first time I can remember, I really feel at home and settled. I just love it there and always look forward to going home. I wouldn't want to be anywhere else. 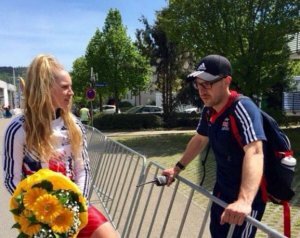 "I work as a centrally contracted as a coach for the GB Cycling Team as a Mountain Bike Coach, working with a small number of riders on the Performance Pathway from 17 years old to senior. 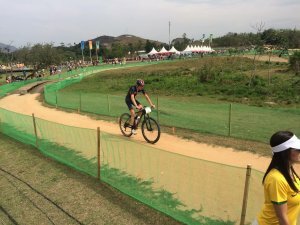 "We have one MTB rider who went to Rio, Grant Ferguson, who is a first year senior, having medalled in both the Under-23 World and European Championships last year." "I was always active and got involved in loads of sports as a kid. Passion in football turned into playing county hockey, and my grandad was constantly throwing a ball at me in the hope that I would take cricket more seriously. "Cycling came later in my teens, with the fashion for mountain bikes and Chris Boardman winning gold in Barcelona in 1992. "I competed at elite level, but by 2002 was already thinking about coaching, as I was realistic about my own physical sealing." "I read sports science at university and I thought by taking the British Cycling Level 2 coaching course, it would support my studies and my cycling. "It was by complete coincidence that BC were lunching a new course, and running one at my university on a free weekend. "However, having taken and enjoyed the course, I soon started to work with some local riders and it developed from there. "I later went on to do teacher training and ran a school cycling club in Swanwick, where I was a PE Teacher at the time." "Initially working with young people at a school club, I then started coaching cyclo-cross sessions at the local Go-Ride club. "A few of the kids from the school group started showing a bit of potential and were tested by British Cycling for the first regional stage of the Performance Pathway. "These BC Talent Team camps and sessions worked really well as they were mainly school holidays, which I was free in, and it went from there." "I decided pretty early that that's what I wanted to do and try and get to. I applied and got a sports development role with British Cycling's Go-Ride development programme. "I took a fairly big pay cut from a teachers wage and moved to Manchester. I felt it was needed to get a foot in the door and open up opportunities which in time, it did. "Despite working for the organisation in a different department, I continued to use most of my annual leave and spare time, volunteering for any GB trip or camp I could get on. "Building up knowledge and experience, following Beijing a role came up working regionally with GB Under-16s, and I've moved on from there." GB athlete Grant Ferguson with coach Simon (top left) watching from the sidelines. "Going to Rio has been a learning opportunity with little pressure, setting us up for four years' time. I attended London though a BOA programme called Ambitions, where coaches and young 'up and coming' athletes were selected to get an experience, setting them up for future games. 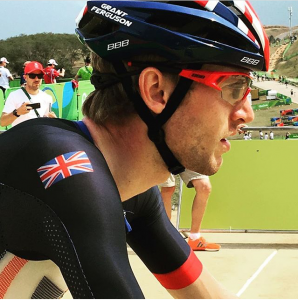 "I attended with Grant Ferguson and now, four years later, I travelled with him to Rio as our selected GB MTB athlete. "However, Grant is very young for our sport, he's a first year senior and there wasn't medal expectations. "This games gave us both the opportunity not only to experience a huge multi-sport event, but also for data collection, so over the next four years we can close the gap and come back ready to handle the pressure of being competitive." "I want to see the sport of XC Mountain Bike grow in profile within the UK. I love the sport and I'm extremely fortunate to be working in this position in the best sport in the world, for the best nation in the world. "The end goal is seeing more young people, at more races, inspired and engaged with what we do as we develop the programme. We want to see young people on bikes because of what the guys in GB jerseys do." 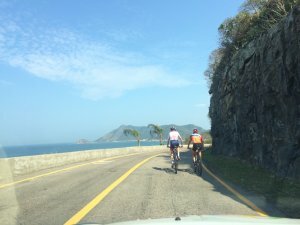 Simon watches from the car as Grant trains on the Rio roads. "To anyone thinking about taking up coaching in Derbyshire, I would say please do. I can't speak for too many other sports, but in cycling we need you. "Volunteer coaches, along with event organisers, club contacts and officials, are the life blood of our sport. "Without them, we wouldn't have the Olympic medals and those that we had would be useless in a few years without the grass roots of the sport being healthy. "Get in it for the right reasons - there isn't much money to be made and there are easier ways to earn it if that's what you are after. "However, its great fun, particularly with young people in a club environment - most of us still volunteer when we can." Grant tests out the Olympic course. "The day I stop developing is the day I stop. I have a few projects in mind for the next two years in areas of the GB MTB programme that hasn't been touched before. "It feels very exciting to be looking to tap into potentially new support services and experts in their field. I wish I could tell you more." To find out how you can get into coaching, you can peruse our course finder and there's also the option to apply for a Coaching Derbyshire bursary.